Since moving into my house, I ride in a car about once a week on average. I try avoid it sometimes, just to see how long I can go, but inevitably I hop on a bus to the village or it starts pouring and I take a taxi or my pule offers me a ride into town that would be rude to refuse. 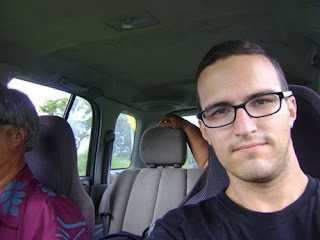 Peace Corps volunteers are prohibited from driving during service, but the variety of cars I’ve ridden in has given me an array of experience riding in cars. 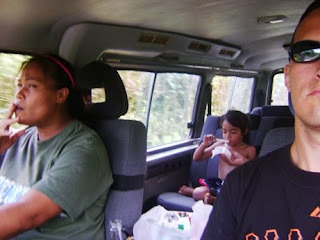 In Samoa, cars are utilitarian. No one spends hours on a Saturday afternoon washing their car or polishing it with a diaper. It’s not like in The States where you roll through a low-income housing neighborhood and you see luxury cars parked on the street. Here, as long as it has 4 wheels and the engine works, it gets the job done. My host family has a car, and though it has no radio or climate control, though paneling is missing in lots of places and the windows have empty hooks where curtains used to be, though the engine seems to be in a perpetually precarious state of near disrepair, it is still a status symbol. Many other families in the village have no car. 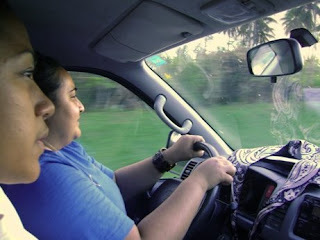 Getting into a car in Samoa, the driver never seems to be on the side you were expecting. Cars are imported here from all over the place, and so there are many cars with the driver’s seat on the left hand side and many on the right-hand side. I heard a rumour they’re only importing right-hand-drive cars now, but I haven’t been able to corroborate that. The next thing you notice is cars don’t travel very fast. It’s extremely rare to go faster than 50 km/h (~30 mph). On a recent trip to Leulumoega, I was with a van full of people, and the driver brought the car up to 80 km/h (~50 mph), and we were all sure we were going to die. 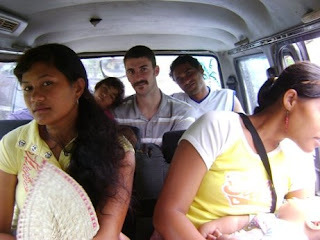 The look of horror on all the faces in the van, mine included, was funny in retrospect given how fast we drive in America. Part of the reason drivers go so slow is the roads are pretty narrow in many places. The main road that goes around the island and the shockingly steep Cross Island road have barely 2 lanes. It’s a narrow fit for 2 cars, so drivers proceed with caution. The other precaution drivers frequently implement is the horn. Drivers honk at each other as a means of saying, “Look out I’m here,” or “I see you there.” You hear honking a lot, but there’s supposedly not really anything rude about it. When I’m out riding my bike, occasionally a whole line of cars will honk at me one by one as they pass, and I honestly think the drivers are doing it as a courtesy. That said, it is grating on my ears, and I can’t help but find it sneering and obnoxious. One final story: My pule gave me a ride into town after it rained yesterday. As we were going through some puddles, the sight and sound of the splashing and the cold air blowing on my feet almost made me think my feet were actually getting wet. The sensation was a little too real, so I looked down, and sure enough, there was a hole in the floor that went straight down to the wheel well. The cold air was not coming from a vent; it was coming from outside. But like I said, the car has 4 wheels and an engine, and it got me to town quickly. And that was all that it was supposed to do. I hope things are well back home. Please enjoy the riding in cars photos below. 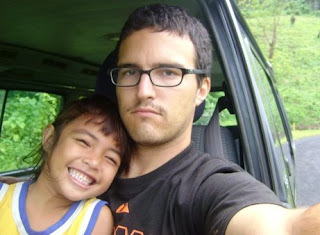 Me getting a ride back to Apia in a stranger's rental car. Saifagalua doing 80 km/h. Crazy. Akanese and me and awful moustache. Barreling down the road. Taxi van on the way to Faleupo. Front row: Back of Koa's head. 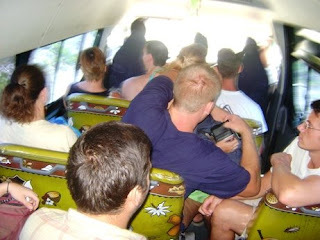 Second row: Back of Briony, Dan, Paul. Third row: Chris, AJ, Erin, Jordan? 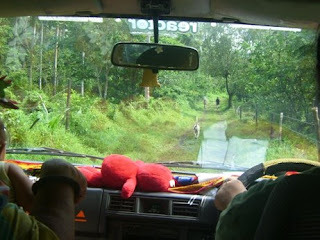 Looking through the windshield on the way to the maumaga, the plantation. hah i love the pictures! i think people honk just to say hi. :P yeah, when i was there i used to get so scared sitting in passenger and no one wore seat belts- AND i had a child on my lap. the mom was driving, seatbelt-less as well. riding on the back of a pickup is another experience in and of itself..everything feels faster when there's nothing to hold onto and the edge of the pickup only goes as high as half your back.